Posted on January 12, 2018 in the programmable-systems series under misfits and liveness. Updated on February 21, 2018. The object of this game is to arrange the instruction blocks (hop-forward, turn-left, etc.) in a sequence such that the bunny following the instructions can eat all the carrots. Unsurprisingly, you only find out if your program works after you press the play button. Why is that? Why no immediate feedback of what the bunny will do as you build the sequence? Is it not feasible? Of course it is! The real reason there is no feedback is because that's not how we think about programming. Lets look at it a little deeper - we write code as text but think hard about all possible effects in the running system after a series of transformations. In other words, we simulate the computer in our head, while sitting in front of a computer - a powerful simulation machine. The irony is deep here, but I completely missed it for the majority of my programming lifetime. The joy of programming was largely the joy of puzzle solving - the correct solution being the accurate prediction of the behavior of some code. This fun kept me from seeing the real purpose of programming - it's not making and solving puzzles, however elegant or clever - it's something else. The idea that a program is a description to be mentally simulated is deeply entrenched -- but is it a good idea? Contrast the 'batch oriented' programming workflow used by the Google game above, to the interactive experience in Joy JS. Here, there is immediate visual feedback as you modify your program. If you've ever used the 'developer tools' tab in a web browser to modify some code and see the effect live, you're doing this live interactive programming as well. Taking this idea further, we can manipulate the effect directly, and have the program update at the appropriate places. The interesting question is how far can we take this idea? Will this just work for little toy programs? Is it only applicable where the final effect is a drawing? I submit that any system behavior you can simulate in your head can also be simulated, more precisely, by the computer itself. So I think live programming is possible not just in small, simple programs but also in large, multi-process systems. I believe what's holding us back is the choice of core constructs in the design of programming languages and systems (the 'systems' is important here because you want the effect simulation to span all parts of the system, across all interconnected 'processes', not just within one 'program'). Our systems and languages are not designed to be interactively evaluated and explored. We're very far from designing or thinking about systems that can interactively show us the effects of any program modification. This is rooted in batch style programming. There are tools and techniques to incrementally improve this experience, for instance by automating the generation of the source text - but is the fundamental model here even a good one? Of particular interest is the complexity added in #3 above, when you consider the combined effect in a system containing two or more OS processes with distinct programming languages and toolchains. Interestingly, Smalltalk environments from the 70s explored a more interactive and live model than what I describe above, but the batch model is still predominant today, in spite of the increase in computing power. How much of our mental simulation could be offloaded to the computer, if we choose suitable abstractions to represent systems and programs? Shouldn't computers simulate and visualize, to a very large degree, the interesting effects and behaviors of our programs, as we create them? 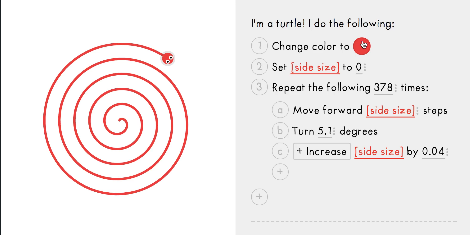 Nicky Case's Joy JS is a fun interactive, programming tool for short drawing programs. you have to imagine and array in your head and you essentially have to play computer... the people we consider software engineers are just those people we consider really good at "playing computer"
Eve was a multi-year project (discontinued since January 2018) that explored the space of making programming accessible to all humans and providing a live, tangible experience. Lamdu aims to 'create a next-generation live programming environment that radically improves the programming experience'. Observable is a new (as of January 2018) notebook style web-based reactive programming environment. All the visualizations and formula added to the notebook are updated live as you update any cell values. Usable Live Programming is a paper by Sean McDirmid that discusses some specific ideas - probes and traces - that could usefully integrate live programming within a typical code editing experience. An interesting paper by Sean McDirmid and Jonathan Edwards is Programming with Managed Time. I think managed time is one core aspect of live programming and I hope to cover that topic in the future. For some more ideas see Live Programming as Gradual Abstraction. The following is an imagined experience that I believe is technically feasible, and should be the usual way of working, but sadly isn't even close to what is available today. Whenever I make some change to a program, I'm really trying to affect some behavior in the system. This might be 'nearby' behavior (such as order of creation of some objects in the same function), or a distant effect, such as change in behavior of a button on a web application. The behavior should be tangible (should have a visualization I can easily create and display on the screen) and live (the visualization should update as I change the code). Further, all steps in the cause and effect chain that link my program change to the behavior should also be tangible and live. Next, read Meta Idea - Finding the Frame.